These stages can be broken down into smaller steps to create a comprehensive marketing cycle, however, the 3 core stages should remain as the primary focus of your marketing strategy. The first stage of the marketing cycle involves getting attention so that people know that you exist and what services you offer. This means having a website, business cards, social media presence etc. Each platform that you use to showcase your business should have a consistent and clear message. Your message should also be interesting so that your potential client is motivated to move on to the next stage in the marketing cycle – positioning. The second stage of the marketing cycle is positioning. Now that you have your potential client’s initial interest, your positioning should deliver a clear message to your potential client about how your service can be distinguished from other therapists. The positioning stage should help your potential client learn more about your specialties and help develop trust in your business and the value that you can provide to your potential client. The final stage of the marketing cycle is the selling phase. This involves getting your client to book an appointment or buy your therapy products. This stage also entails the processes you can put in place to encourage your client’s to return to you. When we think about marketing we tend to think in terms of large companies with expensive marketing campaigns that is meant to encourage us to buy their clothes, drinks, cars or holidays. Marketing is also important in service based industries and particularly with those who are seeking help through therapy. Potential clients are usually at a vulnerable stage when they are looking for help through a difficult stage in their life. Understanding this vulnerability is important when constructing your marketing message so that you ethically promote your business. This means being sensitive to your potential client’s current circumstances and delivering a message that helps clarify the way in which you can help. 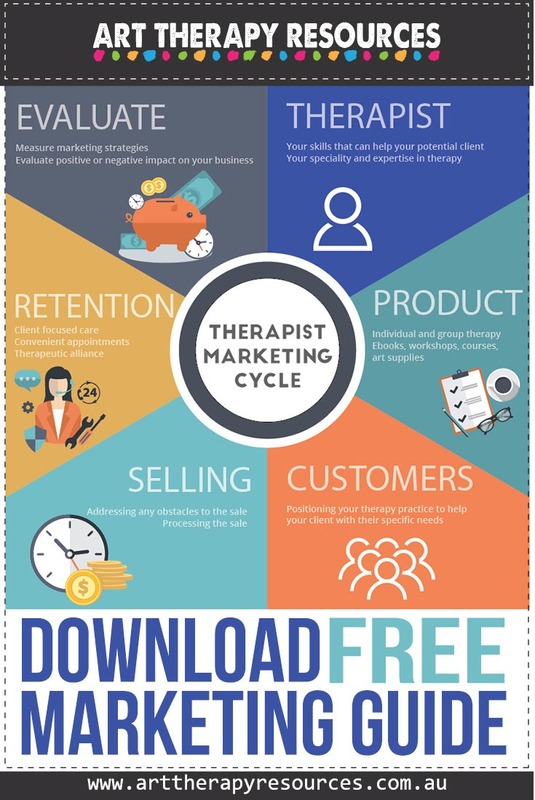 As a small business who delivers services through therapy, your business “product” is primarily focused on you as a therapist and the skills you have that can help your potential client. This means that part of your marketing message will be focused on marketing you and what you can personally offer. In marketing your services, your primary message should be focused on your specific therapy skills and your therapy specialties. Think about the reasons your potential client is searching for your services. If you’re unsure what they may be looking for, then use your past clients as a guide. When your past clients made contact, what were the initial questions they asked you when they made contact? Use this knowledge to create a marketing message around you and what you can offer your potential client. If you provide services only through therapy sessions, then your “product” is your session. To market your therapy session as your product entails giving your potential client some insight into how a therapy session will be run. You can include a general description in your marketing materials which details what your potential client can expect in a typical therapy session. This may include describing how you will help with their current needs and how you utilise art in your sessions. As part of marketing your product, you may also want to address any concerns you think a client may have in participating in the sessions. Some common issues to address for art therapists are whether the client should be skilled at art creating and whether creating art itself with help resolve their problems. If you sell other products in your private practice, such as books/ebooks, workshops, courses, art supplies, this will also require additional marketing efforts. These products rely more heavily on creating interest with images and specific details about the way your product can help your customer. Your marketing message should identify the problem you are addressing and the potential customers who will benefit from using this product. Your marketing message should also clearly state how your product will help your potential client. Who is the potential customer your product can help? What problems will your product help resolve? What is the solution that your product will offer? What results will your product provide? What makes this product unique compared to others? Throughout all of your marketing efforts, you should not oversell the ability of your product to provide cures or give guaranteed results. Attracting your ideal customer entails finding your customer and then positioning your therapy practice as an answer to solving their problem. When seeking a therapist, your potential client’s first problem is not their psychological problem. Their first problem is finding a therapist that suits their requirements around appointment times, cost and your personal approach to working with clients. These issues are the first set of marketing statements that you should make known to your potential clients through your website or other offline marketing platforms. Once your potential client has resolved the issues around accessing your service, they are then concerned with whether you can help them with their psychological problems which your marketing materials should also cover. 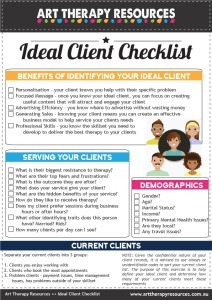 We’ve created a free Ideal Client Checklist to download. This will help you identify your ideal client. One of the most integral parts of the marketing cycle is the selling stage. This is the stage where all your initial marketing efforts begin to pay off and you start to receive commitments from potential clients to use your services. The selling stage relates to the fundamental process of exchanging payment for services, however, it also involves some pre and post selling activities that will help ensure the exchange occurs and that the process runs smoothly. Before the actual sale, you will need to address any last minute obstacles that your potential client may express before booking their first appointment. This may be related to how they feel about the therapy process or whether they see any benefit for your service helping them with their problem. This could include details such as cost and availability to attend regular sessions. Customer retention with therapy clients is a significant concern given it primarily relates to the client receiving the level of treatment they require to help resolve issues. There are a number of general customer factors that can affect a client returning to therapy each week including financial issues, the ability to physically attend therapy each week and other external influences such as work and family commitments. These factors all play a significant threat to your client returning to therapy each week. In addition to these issues, the client may also experience resistance to treatment as a result of their individual mental health challenges. For example, if a client is suffering from social anxiety, attending a session each week may be challenging. This mix of general customer factors and specific mental health challenges should be viewed in context of how it affects your customer/client returning each week and how that affects your private practice marketing strategy. Engaging in marketing efforts for customer retention should be created based on the ethical considerations around your client’s mental health concerns. Knowing whether your marketing efforts are effective requires can only be understood if you measure your strategies and evaluate whether they are positive or negatively impacting your private practice revenue. Comparing your financial results can provide insight into whether goals are being achieved in your practice. This can involve comparing your annual financial results between years but also comparing each successive month to determine if goals are being achieved. You can also compare your client attendance rates between different periods and compare how many clients you were seeing over different periods of time. All of these metrics should be evaluated in context with the amount of advertising and marketing efforts you are undertaking. If you were spending no money on marketing and you were seeing only 1-2 clients per day, this might make sense compared to if you were spending $100 a month on advertising and seeing 5 clients per day. In this scenario, a direct comparison can be made about the effectiveness of spending money on marketing. However if you were spending $100 on advertising in June Year 1 and seeing 5 clients per day and then compared this with spending $100 in June Year 2 and seeing 2 clients per day, this will highlight a need to evaluate your marketing efforts with that same $100. SIGN UP below to download the FREE Marketing Cycle Worksheet. 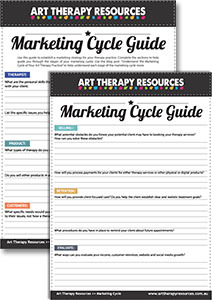 Use the worksheet guide to establish a marketing strategy for your therapy practice. Complete the sections to help guide you through the stages of your marketing cycle. Use this blog post to help understand each stage of the marketing cycle process. Download the FREE Marketing Cycle Worksheet.